What Is an Enzyme Structure and Function? 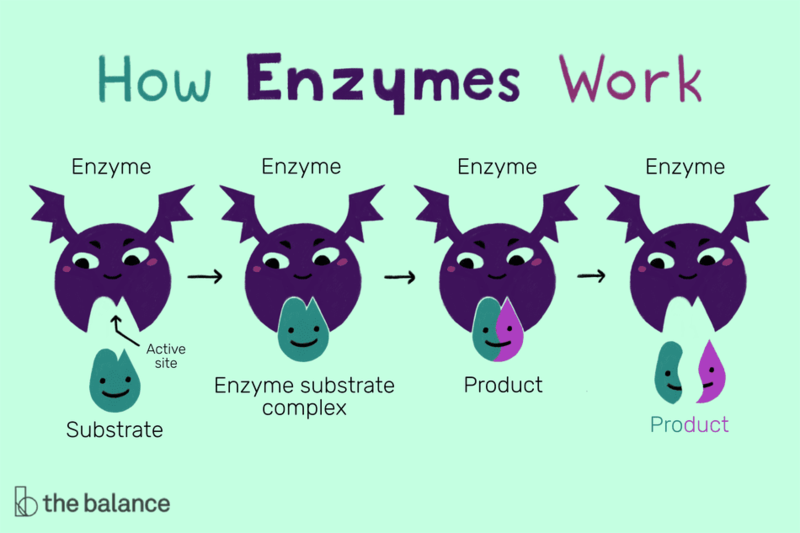 An enzymes is a protein that facilitates a cellular metabolic process by lowering activation energy (Ea) levels in order to catalyze the chemical reactions between biomolecules. Some enzymes reduce the activation energy to such low levels that they actually reverse cellular reactions. But in all cases, enzymes facilitate reactions without becoming altered, like the way fuel burns when it's used. For chemical reactions to occur, molecules must collide under appropriate conditions that enzymes can help create. For example, without the presence of an appropriate enzyme, the glucose molecules and phosphate molecules in glucose-6-phosphate will remain bonded. But when you Introduce the hydrolase enzyme, the glucose and phosphate molecules separate. An enzyme's typical molecular weight (the total atomic weights of a molecule's atoms) ranges from about 10,000 to more than 1 million. A small number of enzymes are not actually proteins, but instead consist of small catalytic RNA molecules. Other enzymes are multiprotein complexes that comprise multiple individual protein subunits. While many enzymes catalyze reactions by themselves, some require additional nonproteins components called "cofactors," which may be inorganic ions such as Fe2+, Mg2+, Mn2+, or Zn2+, or they may consist of organic or metallo-organic molecules known as "coenzymes." Oxidoreductases catalyze oxidation reactions in which electrons travel from one molecule to another. An example: alcohol dehydrogenase, which converts alcohols to aldehydes or ketones. This enzyme makes alcohol less toxic as it breaks it down, and it also plays a key role in the fermentation process. Transferases catalyze the transportation of a functional group from one molecule to another. Prime examples include aminotransferases, which catalyze amino acid degradation by removing amino groups. Hydrolase enzymes catalyze hydrolysis, where single bonds are broken down upon exposure to water. For example, glucose-6-phosphatase is a hydrolase that removes the phosphate group from glucose-6-phosphate, leaving glucose and H3PO4 (phosphoric acid). Lyases catalyze the breakdown of various chemical bonds by means other than hydrolysis and oxidation, often forming new double bonds or ring structures. Pyruvate decarboxylase is an example of a lyase that removes CO2 (carbon dioxide) from pyruvate. Isomerases catalyze structural shifts in molecules, causing changes in shape. An example: ribulose phosphate epimerase, which catalyzes the interconversion of ribulose-5-phosphate and xylulose-5-phosphate. Ligases catalyze ligation--the combination of pairs of substrates. For example, hexokinases is a ligase that catalyzes the interconversion of glucose and ATP with glucose-6-phosphate and ADP. Enzymes impact everyday life. For example, enzymes found in laundry detergents help degrade stain-causing proteins, while lipases help dissolve fat stains. Thermotolerant and cryotolerant enzymes function in extreme temperatures, and are consequently useful for industrial processes where high temperatures are required or for bioremediation, which occur under harsh conditions, such as those in the Arctic. In the food industry, enzymes convert starch to sugar, in order to make sweeteners from sources other than sugarcane. In the clothing industry, enzymes reduce impurities in cotton and depress the need for potentially harmful chemicals used in the leather tanning process. Lastly, the plastics industry continually seeks ways of using enzymes to develop biodegradable products.